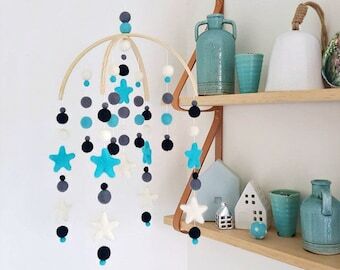 Love this mobile? Keep Reading! 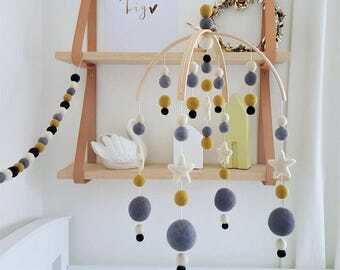 Gorgeous felt ball mobiles made in New Zealand! Beautiful neutral baby mobile, in soft and natural colors - white, cream and a light marbled brown. Our felt balls are made in Nepal of 100% New Zealand wool and each ball is individually rolled. 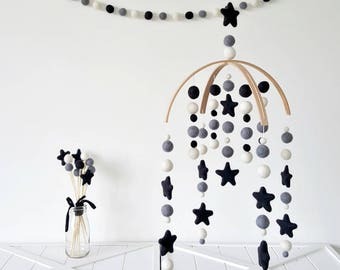 In this design we use a mixture of 1cm and 2cm felt balls and our stars are 3-4cm across. 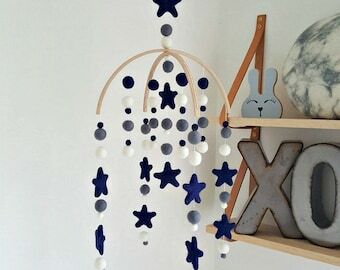 There are no knots between the felt balls so with a gentle pull you can move them and customize the position of the balls. Please note that they will not move on the string unless you move them. 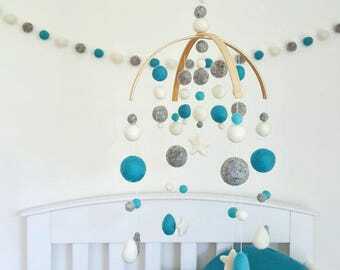 We have nearly 70 color choices in our felt ball range as well as stars, hearts and raindrops. 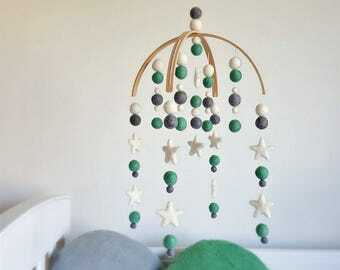 We are more then happy to custom make according to colors. Just send us a message we can get it sorted for you. 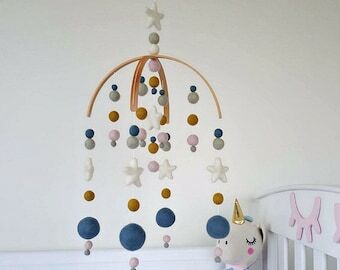 This mobile for your sweet baby measures approx 25cm in diameter and 35-40cm in length, not including the string for hanging above the arch. Shipped pretty fast and it is so adorable! I love it!! 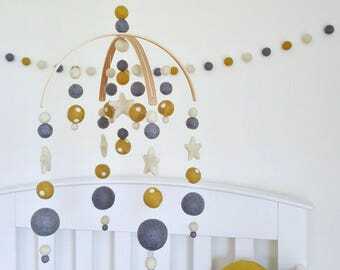 Our specialty is custom made baby mobiles and because we have such a large range of colors and sizes we can create so many designs with them. If you are interested in a custom design please send us a message. We'll work with you to design the mobile that you want, not just the mobile a designer says you should have. 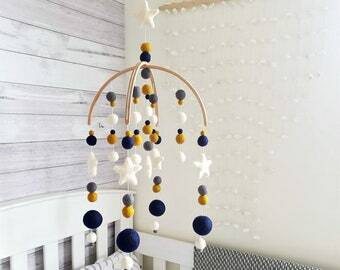 We will send you sample photos of what your chosen colors and design will look like before you buy - how cool is that! We'll make the process smooth and easy and we'll do it quickly too. And best of all, it doesn't cost any extra. 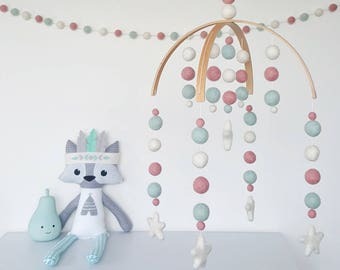 All our baby mobiles are wrapped in acid free tissue paper and then boxed. 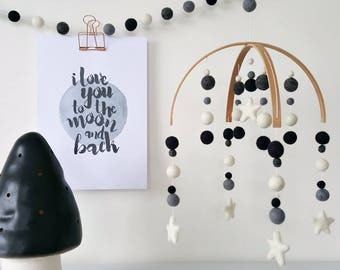 We're happy to add in a note if you are sending it directly to someone as a gift - just left us know at the time of purchasing. 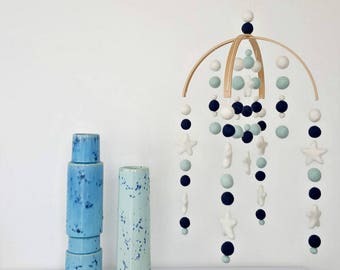 Our mobiles are super pretty so please remember that they are for decorative purposes only. 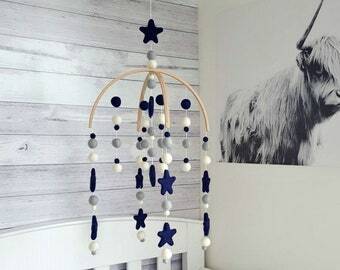 Please make sure that you secure it correctly above your baby's crib and that you shorten the string as your baby gets older so it stays out of baby's reach. So we're pretty speedy here at Tik Tak! We aim to get our orders out 1-4 business days after your payment has been processed by Etsy and that includes our custom orders. We'll let you know as soon as it's been sent and if we have any delays at all we'll talk to you about it. Ahhhhh yes...the dreaded area we have no control over. For orders outside New Zealand we send it untracked by International Air. International estimates are: Australia 4-10 business days and Rest of the World 5-28 business days though please keep in mind these are the official estimates provided to us and we cannot guarantee them. If you are international then your order may incur a customs charge or an import duty charge. These are your responsibility and you can get more info online or through a local customs office if needed. We are more then happy to combine shipping. 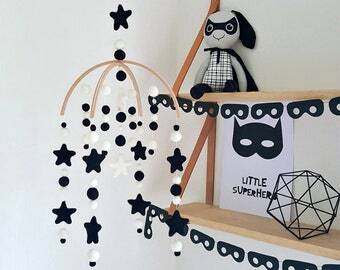 Just send us a message and we can give you a combined shipping price. 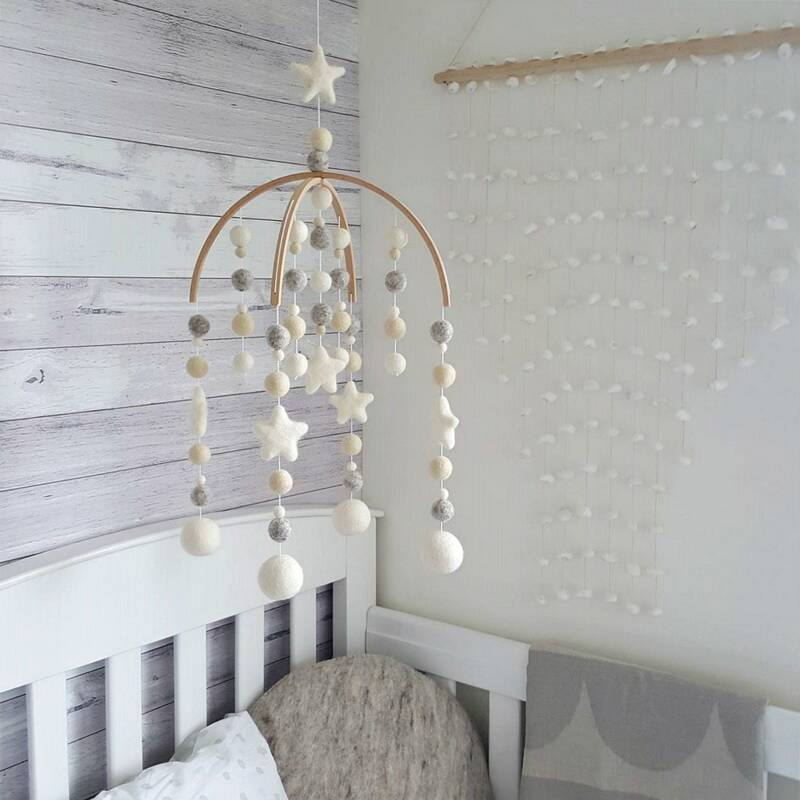 Our baby mobiles measure approx 25cm/10in in diameter and the length can vary depending on the design style. We put the info at the bottom of each listing which is particular to that listing design. 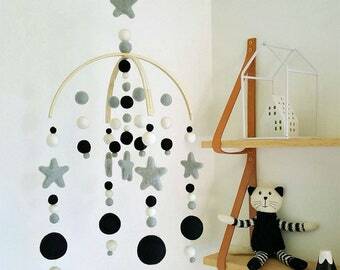 We also give you a long length of string (at least 1.5 metres) for hanging. That way you can adjust it to the length you want with plenty to spare.